This firery infielder was known for performing in the clutch and for being a party animal as a player. He wasn't much different as a manager--regarded as a winner, but he often brawled with umpires and occasionally his own players. He did win three league championships and one World Series. 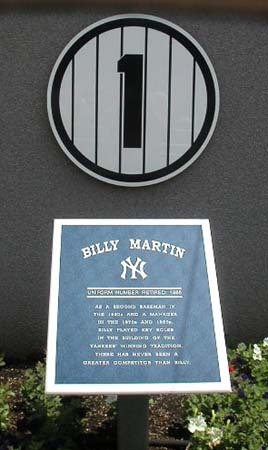 The Yankees retired his number 1 despite his famous dispute with star player Reggie Jackson and owner George Steinbrenner: "They deserve each other. One's a born liar [Jackson], and the other's convicted [Steinbrenner]."